Rock bands rarely have females as their band leader especially when the rest of the band members are male, but ‘New Years Day’ isn’t like any other rock band. The 5-member gothic band has been lead by Ashley Costello since its inception. With her at the frontline, New Years Day has risen to become one of the most renowned hard rock bands in America. The band has released at least four studio albums, the most successful being Malevolence which snagged a spot on the covetous Billboard 200 at number 45. Here is everything you should really know about their leader, Ashley. Ashley Costello was born in Anaheim, located right outside Los Angeles, in California on the 21st of February 1985. Having grown up admiring the likes of Gwen Stefani, Costello loved music from childhood and often wished to someday be a music star. Gwen, at the time, was making waves with her band ‘No Doubt’ when Costello about 11 years old. Ashley Costello attended Loara High School which, coincidentally, was the same school that her idol Stefani attended. As the story goes, her love for Gwen Stefani wasn’t just because of her music style but fashion sense as well. Ashley Costello saw her dreams come true in 2005 when Adam Lohrbach, the bassist of the band, ‘Home Grown’ left in a bid to start something fresh. He was friends with Ashley as well as Keith Drover. Together, the trio began making music about the romantic breakups they had gone through in their individual lives. Costello did the vocals while Drover was on the keys. They recorded several songs together before they were joined by Eric Seilo, a bassist with whom they started touring with. After Seilo’s departure at the end of 2005, Ashley and her friends decided to name the band New Years Day to mark a fresh start in their musical journey. New Years Day capitalized on the growing internet to promote their music. They became very popular on the MySpace website and soon were featured on MySpace Records. Seeing their potential, a couple of record labels showed interest in their band with TVT Records winning the race. With the label, New Years Day released their self-titled EP in 2006. Their debut album My Dear dropped in May 2007. 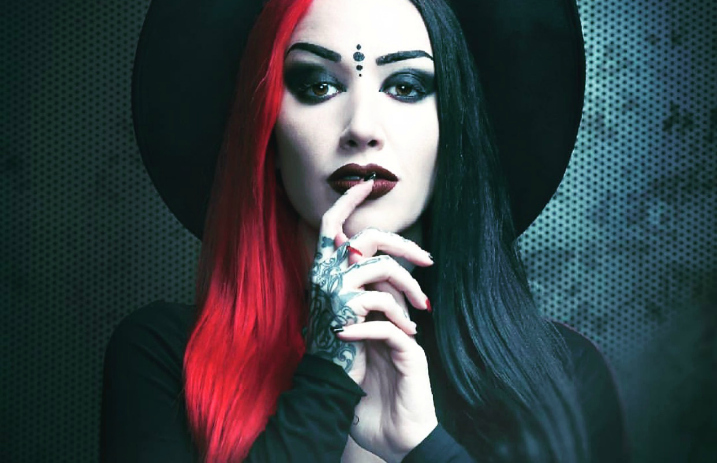 New Years Day has been through a number of setbacks over the years from bandmate departure to label financial struggles; however, through it all, Ashley Costello has remained the backbone of the band as they worked hard to rise into glory. Ashley Costello was born to two happy parents who raised her together until her dad divorced her mother a few years after her birth. As a result, Costello nurtured strong hatred towards her father. Her single mother raised her alongside her older sister. Ashley Costello has long been on the path of starting her own family. Her first romantic relationship to come to light was with her bandmate, Nikki Misery who joined the band towards the end of 2012 as its lead guitarist. Misery had come in fresh off his education from the Musicians Institute and immediately wowed fans with his energetic and dramatic on stage performance. Sadly, their relationship didn’t last long as they eventually broke up with Misery remaining as the lead guitarist. 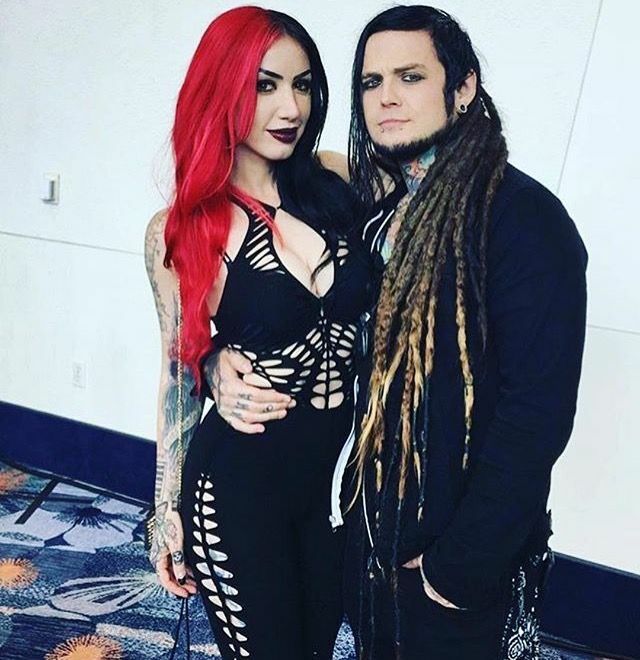 Ashley Costello would then move on to dating metal singer, Jimmy Trigger in August 2016. Trigger is best known for performing with the band – SWITCHPiN and the Los Angeles-based group – We Are The Riot. They became engaged sometime in March 2018. The metal singer popped the question like a real gothic lover, in front of Kilkenny Castle with a gothic-themed black ring designed by Izandco. Both parties, shortly after, took to their respective Instagram page to share the news with their fans. Jimmy, in addition to his music, is known for being heavily tattooed. • Ashley Costello was a victim of bullying in high school. As a way to ease her frustrations, Costello began drawing comic books that had stories of herself killing the girls that bullied her. Her principal would eventually get to see it and as a result, she was asked to see a counsellor. • She loves to play video games and her favourite includes The Elder Scrolls V: Skyrim & Overwatch. • Her signature half black half red hair was inspired by the classic Harley Quinn. • Ashley Costello runs her own clothing line called Bat Royalty. They have collaborated with Iron Fist clothing. • Costello stands at a height of 5 feet 4 inches tall.